EMODnet Human Activities now includes two new datasets: ‘Finfish’ and ‘Hydrocarbon Extraction – Active Licenses’. New map tools have also been released. 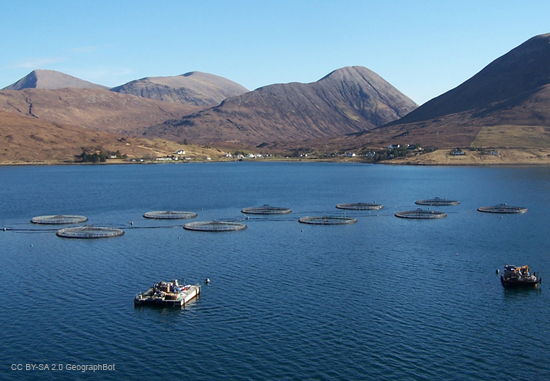 The finfish dataset provides information about the location of seawater finfish farms, including company, species and distance to shore. Data is provided for Cyprus, Denmark, Greece, Ireland, Finland, Spain and the UK. There are no sea-based finfish farms in Belgium, Bulgaria, Latvia, Lithuania, the Netherlands and Poland. There is a significant production in Italy and marginal productions in other member states but they were not able to provide geolocation data. The ‘Hydrocarbon Extraction Active Licenses’ dataset contains polygons representing active offshore hydrocarbon licenses in the following countries: Croatia, Denmark, Germany, Ireland, Italy, Netherlands, Norway, Poland, Portugal, and UK. Where available each features contains information such as type (exploration, exploitation), licensing round, starting year, ending year and operator. New map-based tools have also been developed. It is now possible to filter the display of many of the map layers via the legend using multiple attributes. The map can also be made full screen, and your current map view can be shared via a URL link for use in social media.